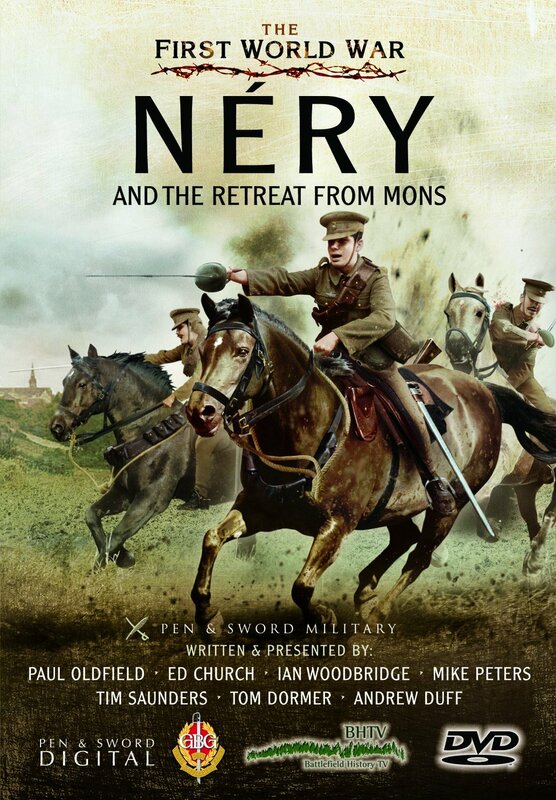 ‘Nery and the Retreat from Mons’ picks up where the previous DVD in this series left off, with the British continuing the retreat from Mons following the stand of II Corps at Le Cateau. The same format is followed, utilising a wide variety of maps, pictures, and ‘on the ground’ analysis to provide a well-rounded view of the events of late August and early September 1914. The presenters follow the route of the retreating BEF via Etreux, where the 2nd Royal Munster Fusiliers engaged the Germans in a necessary but costly rearguard action, and St. Quentin, where the exhausted British troops were on the brink of surrendering. The action at Cerizy, where Allenby’s 1st Cavalry Division carried out a textbook cavalry attack, particularly benefited from the presenters’ presence at the site of the battle showing how the landscape played a role in the outcome. Whilst focusing on the chronology of events the film is also interspersed with segments covering salient points such as rations, footwear, the 18lb shrapnel shell, and the ‘Angel of Mons’ myth. Other relevant areas are also covered including the development of the RFC’s role in observation. The failure of the Schlieffen Plan is analysed (the maps helping to show how the situation changed), and the relationship between the French and British scrutinised. The film then looks at the engagement at Nery which took place on 1st September 1914. Whilst the entirety of the action is well covered, the role of ‘L’ Battery of the RHA is given particular scrutiny. Coming under unexpected German fire five of the battery’s six guns were quickly put out of action. The sixth continued to return fire against all odds. Three Victoria crosses were awarded for the action and the gun is now displayed in the Imperial War Museum. The presenters cover the role of the cavalry in the attack, and in particular the German flaw of launching a cavalry attack across a ravine. The end of the film covers the final stages of the retreat until 5th September, and sets the scene for the next instalment examining the battles of the Marne and the Aisne. The Battlefield History TV team have established a format in this series and stick to it. Their knowledge is apparent and showing the ground over which these actions took place really enhances understanding of the events, particularly if you have not visited the areas being discussed.